Greg Heffley uses sarcasm and wit to mull through his first year of middle school with his best friend, Rowley. This funny flick brought up memories of my own middle school experience as I thought back to the horror of those days and the fact that I never want to go back. The film's use of a moldy piece of cheese - left on the blacktop near the basketball hoop to visually show time passing - was both brilliant and creative. But the "Wimpy Kid" showed the struggles of growing up and trying to figure out how to fit in. 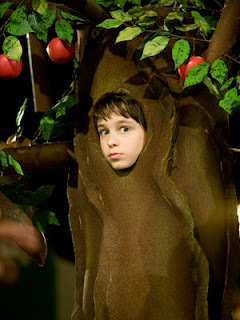 Bombarded with possible after-school activities to join and being terrorized by older kids (especially Greg's older brother, Rodrick), Greg, Rowley and the other kids discover survival skills as they avoid the bathrooms with no door stalls, skins v. shirts PE games, and wearing ridiculous costumes for the school musical. "Diary of a Wimpy Kid" might not be the most hilarious movie out there but it was worth a ticket. The kid actors were spot on in their stereotypically middle school kid roles. And the adult actors were surprisingly cast with some greats like Steve Zahn, Rachael Harris and Rob LaBelle - as the safety patrol-loving principle. Do you like to Twit?